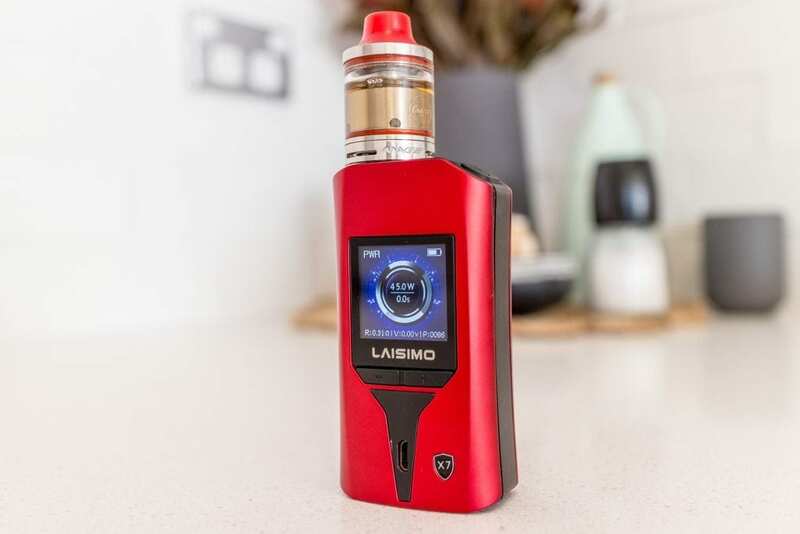 Laisimo X7 Wyvern 235W Box Mod Review - Daily Vaping Deals & The Best Vape Product Reviews at Vaping Cheap! Designed and inspired by the most advanced Ferrari auto model, the Laisimo X7 Wyvern is a 235 watt capable box mod. It is powered by two 18650 cells, features TC mode and a slew of protection features. It sports a large colorful display and a 1.5amp USB charging port. 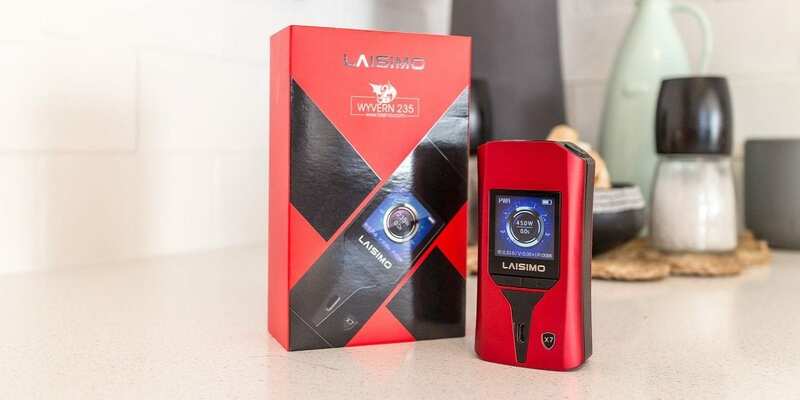 I would like to thank GearBest for sending us the Laisimo X7 Wyvern 235W Box Mod to us for the purposes of this article. Click Here to Check Out the Laisimo X7 Wyvern Box Mod! The packaging on the Laisimo X7 Wyvern 235W Box Mod is quite visually appealing. It comes in a black and red box with an outer shell that slides off the reveal a black box. Inside, the mod is protected in a felt covered foam that will ensure it will not get damaged in transit. Upon inspecting the mod for the first time, I was initially impressed with the small form factor for a dual 18650 device. There are no straight lines on it at all and it seems to taper and curve on each corner. I received the red model and it is also available in black. The red model is predominantly red, with black highlights and looks impressive. The mod feels nice to hold and gives off a nice ergonomic presence. The face of the X7 Wyvern features a large 1.3 inch color screen and a micro USB port for charging. There are +/- selection buttons, which I hate to say have some rattle to them. The back of the mod is the magnetic battery door which slides down to install your cells. It is easy to slide down and remove and holds in quite well with enough magnetic force. There are no rattles present in the battery door or the tray with the batteries installed. On the top of the mod there is a standard looking spring loaded 510 connector. The fire button sits angled in a bevel on the mod which looks and feels nice. There are some battery vents on the battery door. Overall the X7 Wyvern looks good and the build quality seems to be okay. The finish is top notch, however something about the mod feels a little cheap and like it would not take too much of a beating. Only time will tell on this one. Installing the batteries is very straight forward. Simply remove the battery door by sliding it towards the base of the of the mod and remove it completely. The battery orientation is clearly marked in the battery tray and there is a ribbon that sits behind the batteries to aid in removing them. It is recommended to use a married pair of high drain batteries in this device. Please ensure you are practicing high caution when it comes to battery usage and safety. You can brush up on our article on battery safety here. Once you batteries are installed the menu system is quite easy to navigate and operate. Five clicks on the fire button with turn the mod on or off. Once you are at the home screen, the mod will ask you if the atomizer is new. Follow the prompts to select either a new atomizer or the previous one used. It will then prompt you to choose modes. You can choose from Power mode (watts) or 3 TC modes – Ti/Ni/SS. You can also select one of two DIY modes which are setup for you to enter your custom TCR values. Use the +/- as you normally would to scroll through wattage or TC levels. To go back into the mode selection menu, hold both button down until the options appear. Pressing the + and fire button together will lock and unlock the device. Pressing the fire button three times will display some generic information about the chip. Installing atomizers is the same as any other box mod. The X7 Wyvern will accommodate atomizers up to 25mm before any overhang is present. The manual states that you are able to update the mod via the USB cable, but up to now there is no new firmware available for it as far as I can find. The Laisimo X7 Wyvern 235W Box Mod certainly gives a satisfying vape experience. There is little to no delay from pressing the fire button to the coil firing. It’s definitely not instantaneous, but for a mod of this price it does a good job. The fire button is nice and clicky and it is responsive, I think the angled bevel helps here. In wattage mode, the X7 Wyvern works well and delivers what is advertised. TC mode works just as well and appears to be quite accurate. The supported TC modes seem to be programmed well, however there is no setting for SS316L which needs to be programmed into one of the TCR slots. Once I programmed in my favorite TCR level, the X7 Wyvern acted fairly accurately to what I a used to on other TCR enabled devices. Battery life on the X7 Wyvern is pretty much on par with any other dual 18650 mod available on the market. It wasn’t outstanding, nor was it lacking at all – pretty much stock standard in my usage. Battery life is always also dependent on your vaping habits and what is subjective to you and your use. The batteries seemed to hold up all the way through the range without dropping out or backing off in performance when low. The color screen on the Laisimo X7 Wyvern 235W Box Mod is quite nice to look at. It displays of the required information well and is quite nice to look at. It can be slight challenging to look at in bright light, however during normal usage it is fine. 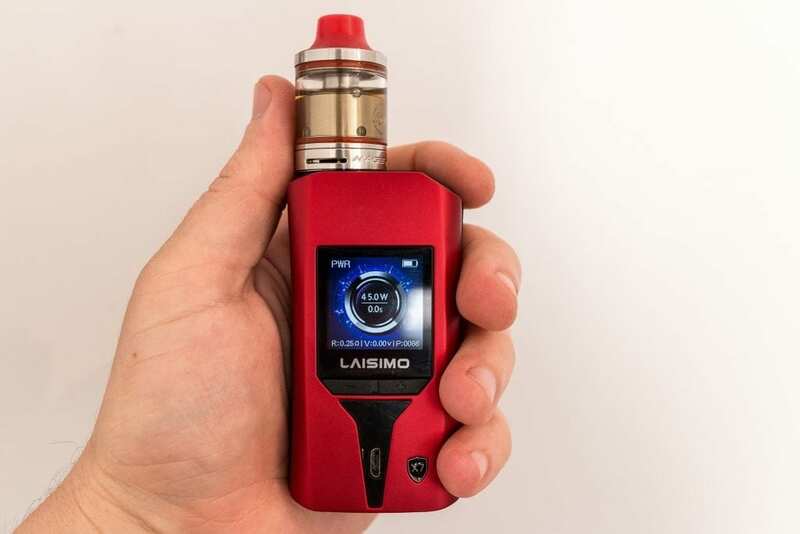 Given the size of the Laisimo X7 Wyvern 235W Box Mod, it fits in your pocket just fine. It is definitely a pocketable device and it won’t weigh down your pocket with unnecessary bulk. It is a device that you will be able to take when you are out and about very easily. I didn’t have any misbehavior with the chip or misfiring when using the X7. All in all I think the Laisimo X7 Wyvern 235W Box Mod performed quite well. For the price point, I think you definitely get what is being advertised and you will get a mod that should not let you down in terms of performance. It is definitely not as refined as some of the more expensive dual 18650 mods on the market, but I do think this definitely has a place in its price point. I would recommend this mod for a budget minded, well performing little dual cell device. If this is something that is of interest to you, I would encourage you to pick one up and give it a go. I hope this has helped on your quest for a new box mod. If you have any questions or comments, please feel free to leave them below. We always appreciate your thoughts. This isn’t a comment as much a question, have you taken it up to the 235 watts and tried it? Couple of videos I’ve seen guys are saying they didn’t believe it was hitting the actual 235 watts it claims! And before anyone gets after me check YouTube, there are 3-4 videos,that I watched they pretty much said the same thing! !